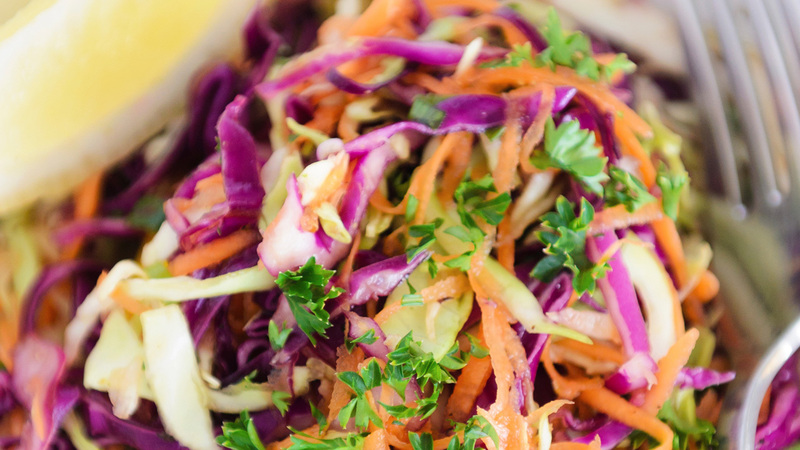 Home » BBQ » Make Your Own Delicious Cole Slaw! Coleslaw seems to only show up on our table during summer barbecues, where it is often passed up for other mayo based side dishes such as potato and macaroni salad. Coleslaw is a dish that can be enjoyed at any time of year and can also be a wonderful addition to sandwiches for extra contrast and flavor. It is still a popular dish in other parts of the world, such as Germany and the Netherlands, where the dish originated. The term “coleslaw” comes from the Dutch word koolsla, meaning “cabbage salad.” Below is a recipe that makes a savory, sweet, and crunchy slaw. Combine the shredded cabbage and carrots in a large bowl. Whisk together the mayonnaise, sour cream, onion, sugar, vinegar, mustard, celery salt, salt, and pepper in a medium bowl, and then add to the cabbage mixture. Mix well and season to taste. 2 Comments on Make Your Own Delicious Cole Slaw! I’ve only used mayonnaise with coleslaw. Like your recipe.